An itinerary to discover the extraordinary natural beauties that characterise Iceland’s northern region among towering mountains, spectacular lakes and waterfalls and evocative volcanic landscapes. We start our excursion with a sightseeing tour of Eyjafjordur, the longest fjord in Iceland from which we can admire the Akureyri outline and the beautiful snowy mountains. After the Vikurskard mountain pass, the Fnjoskadalur valley appears before our eyes. Its rock formations still bear visible signs of the geological phenomena that took place in the region in the Glacial and Post-glacial period. 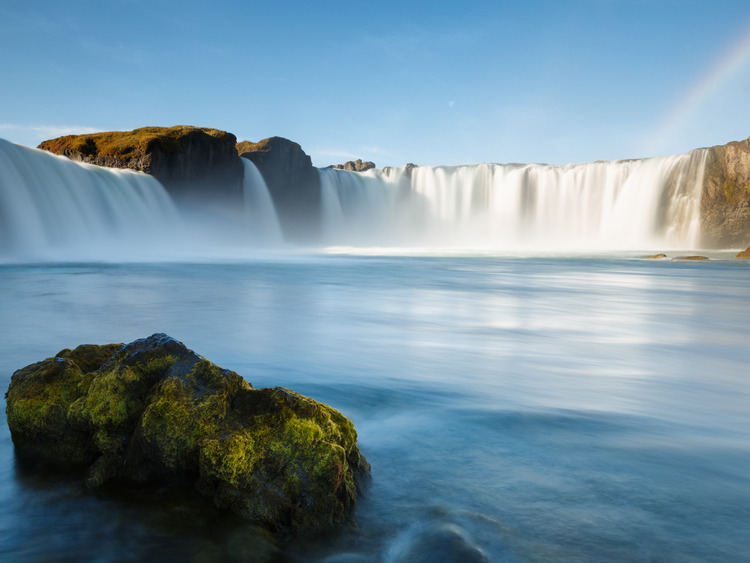 We make a stop at the superb Godafoss waterfall, whose shape is reminiscent of the more famous Niagara falls even though it is only 12 metres high. The word Godafoss literally means "Waterfall of the god” due to a legend according to which, around the year 1000, the Icelandic threw pagan idols into its waters when they decided to adopt Christianity as a national religion. We then reach lake Mývatn, where lava rocks and volcanic formations create unique views which we can capture on our cameras. Our next destination is the Dimmuborgir lava labyrinth whose name literally means “dark fortress”. It is a spectacular location with peculiar rock formations, columns, archways and unexplored caves. Finally, we stop at the Namaskard sulphur springs: springs of molten rock boil in a landscape where the yellow and red colours prevail interrupted by white sulphur fumaroles and small geysers. We then head back to the port while enjoying a brief sightseeing tour of Akureyri, weather permitting.